In the sunny neighborhood of Prenzlauerberg, among the traditional European pale stucco apartment buildings that line the street is a strange, squat bunker-like building with a bright red door. This is REH Kunst, which stands for Raumerweiterungshalle, literally “space-extending building”, a DDR era modular, transportable building, which is now being used to host art shows and events. Since the beginning of June, and continuing until the last day of August, REH Kunst surrendered control over the space to This Red Door, a collective organized by Jomar Statkun, Jared Friedman, and Christopher Stackhouse from New York that is hosting a series of events, exhibitions, dinners, and conversation sessions. 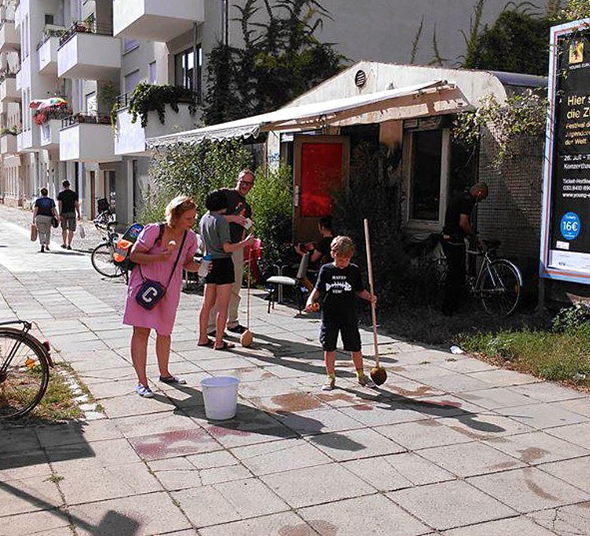 On August 6, 2013, artist and performer Christine Cheung and dancer WOOGURU were organizing street painting with water and giant sponge brushes, allowing passerby to leave their temporary marks on the sidewalk. Cheung demonstrates by drawing a series of sweeping, gestural lines in varying thicknesses and intensities; they dry slowly in the sun. Beside her, a small, lively boy drags a brush twice his height clumsily along the pavement, creating lumpy circles and shapeless squiggles with an infectious amusement. WOOGURU sits on the steps nearby, strumming a guitar in an endless improvisation. Passerby walk along the pavement, some with a sense of purpose, others at a stroll, stopping to watch the performance. Like the comically out of place DDR mobile building, this scene appears slightly absurd: art seems decontextualized in this commonplace environment. Why is seeing art in an everyday setting absurd? Why is it that we perceive creativity restricted to art, and art restricted to only a certain number of activities? To vaguely reference Adorno, within a capitalist system art is presented as the nexus of creativity, the one inspiring and original activity that is meant to justify, or provide an alibi for, the banality of other actions. This sanctifies art – presents it as something sacred, eternal and untouchable – and creates a neat binary distinction between art and everyday life. This Red Door tries to reveal the organic dynamism of art and the creative potential of the everyday: installations at This Red Door are experiments, improvisations, events which are catalysts for group conversation. The door is open from the early afternoon too late at night, and even when no event is planned people (both friends and complete strangers) stop by without warning or ceremony to sit and talk, eat, or drink. The space demands to be lived in; works of art and remnants of events collect in the space rather than being immediately removed, creating a natural dialogue between the different pieces. Each new happening leaves its traces on the space, every time one enters new objects have been added, previous ones subtly rearranged. This reveals the temporality of art and stresses the importance of the physical and social environment of art, effectively undoing the illusion of art’s autonomy and isolation. “Art is fetishized in commercial galleries,” Chris, one of the organizers, explains in a softly provocative tone. What he is referring to is the reduction of art to a purely economic value, manifested in price tags and artist’s names, that displaces appreciation of art from the artwork itself. This is true particularly in art galleries and openings where people walk through a gallery at the same respectable slow shuffle and then chat with acquaintances, as Jomar points out, rarely about the art. The success of This Red Door reveals that there remains a need for art and creative thought in daily life which is not being satisfied by the institutional art scene. The organizers of This Red Door explain that people come to their space with no agenda and are offered no economic or social gain, instead, they return, again and again, for the promise of a stimulating conversation and to participate in a community of passerby, neighbours, strangers, friends and friends of friends. Chris mentions that in some ways, their experimental collective is out of place among the middle-class family homes of Prenzlauerberg. 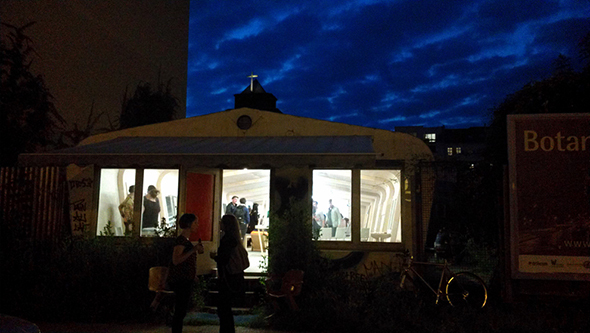 It might have been easier for the collective to be established in a place like Neukolln or Kreuzberg, though, really it is a place like Prenzlauerberg that lacks and needs an innovative artistic community center. Events emerge organically from the community – Jomar recounts the story of a young, first year art, music and film student from Hamburg who found himself returning to This Red Door for the atmosphere and conversation, and is now exhibiting his drawings and collaborating on performances. The events vary in subject matter and form: at one previous event on August 9th, 2013, the mobile kitchen cart – a small cart on wheels that is equipped with all the necessities of a kitchen: burners, cutting boards, knives, pots and pans – stopped by This Red Door to give a lecture about social awareness and community living while another group cooked a large pasta dinner for all attendees and passerby on the street. People sat on the pavement or ate standing with a relaxed informality. 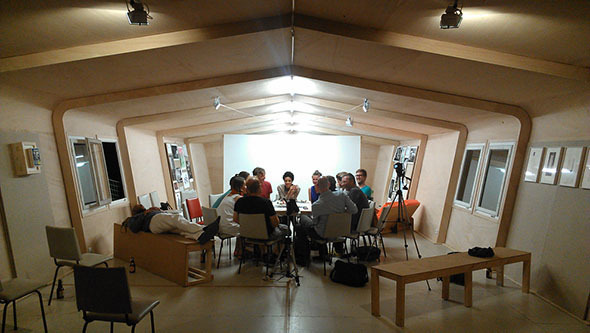 At a different event on July 10, 2013, titled “Personal Desire Propoganda”, 28 artists exhibited silkscreen prints of a personal desire, which were open for general discussion. This rest of August will feature at least one event every day, organized in a calendar which is constantly being updated on This Red Door’s website.